Undeniably the biggest thing about Justice League: Cry For Justice, has been it's ability to showcase the amazing talents of painter Mauro Cascioli. 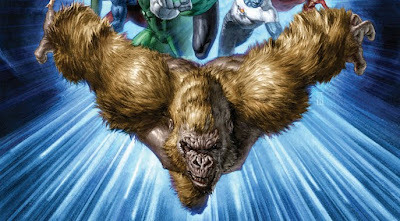 Able to paint a pile of Readers Digests and make them look interesting, the just released cover of the final issue in the DC mini-series shows, when it comes to painting mega-angry golden gorillas, no one even comes close. Wow. See the cover in full here.